UPDATE: The inaugural M+DEV conference has ended. Visit the official M+DEV website for the latest news about next year’s show! Did I just get you excited about a video game involving the cheese, beer, and the Packers? Sorry, I didn’t necessarily mean to do that. What I do want to get you excited about is that many of your favorite video games are being made by your neighbors, friends, and colleagues in the beautiful state of Wisconsin. Here’s a true story. Until Constance Steinkuehler, Kurt Squire and the folks at MadREP got us together over beer on a fateful August evening in 2014, I don’t think we realized how many there were of us. Sure, we knew some of the studios that existed and knew a few of their titles, but we all kind of kept to ourselves. A lot has changed since then. We are now the Wisconsin Games Alliance and our mission is to grow and promote the area as a premier hub for video game development both domestically and abroad. To support our growth, we have a deep commitment to growing, attracting, and retaining top industry talent that is as diverse as the people who play our games. We’re member-managed and most activity spurs out of a 20-person Steering Committee who step up to lead initiatives that fit in our mission. Our studios and talents cover most all of the aspects of the video game industry. We make AAA games like Call of Duty and Lost Within, mobile games like Dragon Soul and Prune, educational video games like Win the White House, indie games like Race the Sun, theme park games like MagiQuest, cross-platform titles like Vendetta Online, as well as VR and AR titles that are all in the works. Our studios self-publish, partner with publishers, and make games on a contract basis. As a part of our mission, we decided that 2017 was going to be the year where we launch our own professional development conference for video game devs called M+DEV. 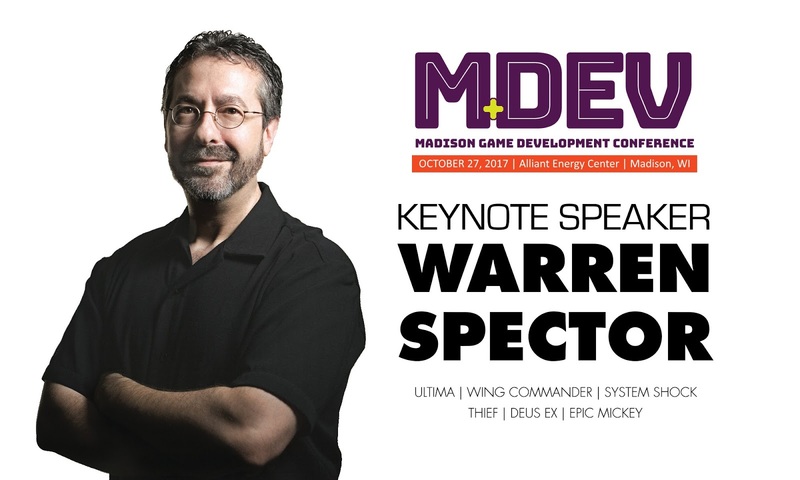 As a part of the conference, we are bringing in key industry speakers like Deus Ex designer Warren Spector to address our audience of game developers from across the Midwest. If you are a game developer, we hope to see you there! Tickets are available now! Filament Games is member studio of the Wisconsin Games Alliance. Filamentarian Jennifer Javornik is the Co-Director of the Wisconsin Games Alliance while Filament Games Co-Founder Dan Norton and Filament’s Development Director Arthur Low serve as Steering Committee Members. Filament Games is proud to be one of the inaugural sponsors of M+DEV.